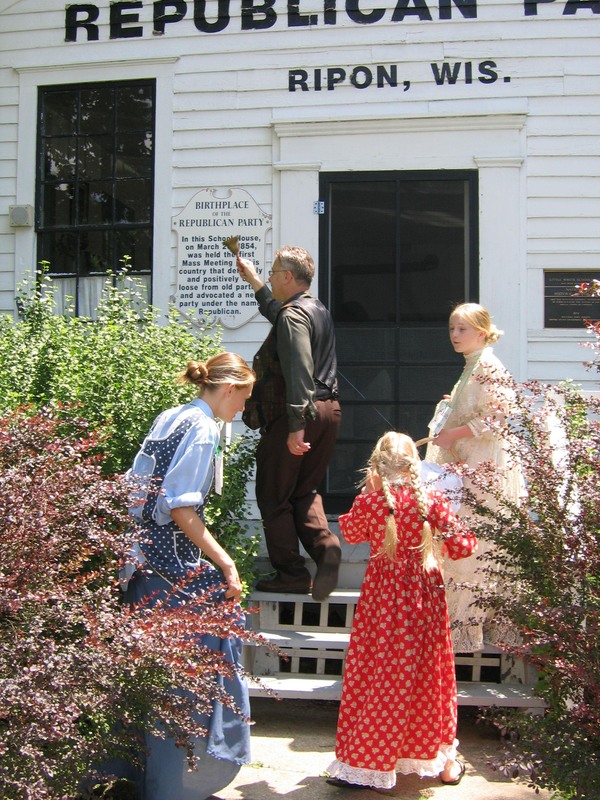 Ripon’s Little White Schoolhouse, a National Historic Landmark, hosted the first political meeting of the Republican Party. The western part of what is now the city of Ripon, Wisconsin, (population 7,268) has its origins in 1844, when 19 members of the Wisconsin Phalanx, followers of the social philosophy of Charles Fourier, traveled from Kenosha, Wisconsin, to create an experimental socialist community. In 1851, the community, known as Ceresco, abandoned its socialist experiment, although it had been economically successful. In 1849, Captain David P. Mapes arrived in the area and fell in love with the nearby Silver Creek. Mapes and another settler built a gristmill, and he named the new settlement on the hill above Ceresco “Ripon” in honor of his English ancestral home. In order to encourage settlement in Ripon, Mapes gave away parcels of land upon condition that recipients would make improvements to the community or erect specified buildings. Ripon soon had a mill, hotel, post office, blacksmith shop, and several stores that attracted many new settlers. Ripon College, a noted liberal arts institution, was founded in 1851. In 1854, a citizens group met to protest the opening of the Kansas and Nebraska territories to slavery. Disgusted with the failure of existing political parties in the U.S. Congress, they formed a new political organization and called it the Republican Party. Ripon’s Little White Schoolhouse, built in 1850, hosted the first political meeting of the Republican Party. The structure, recently restored, was declared a National Historic Landmark in 1974. Another historical building, the Pickard House, was built during the 1870s and houses the Ripon Historical Society Museum. Heritage tourism walking guides are available for each of the city’s historic neighborhoods. Ripon celebrates the Dickens of a Christmas Festival each December, featuring “living windows” in storefronts with Victorian displays, as well as a holiday tour of homes. Visitors can walk through one of Ripon’s numerous historic neighborhoods, historic sites, or the Watson Street Commercial Historic District.